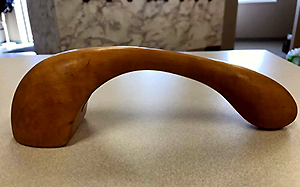 What on earth is this object with a very old version of the LiU logotype? And how did it end up in St. Louis, USA? Is there someone out there who can help solve this mystery, which came in on the LiU facebook page? 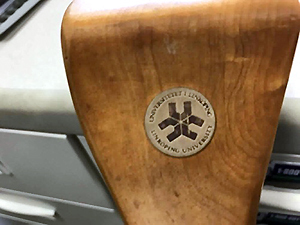 Included with the message were several photographs of a wooden item with a very old version of the LiU logotype. Tj Oliver runs a property company in St. Louis, USA. One of the customers had the item and Tj bought it, hoping it was an example of Danish design. Oliver happens to be a great admirer of modern Danish designers. It’s enough to drive anyone crazy. What is it? How did it end up owned by an individual in St. Louis? Has LiU ever had an exchange programme or visited Washington University in St. Louis? If anyone knows, or has any ideas about the explanation, contact Eva Lena Rodriguez or Elisabet Wahrby.